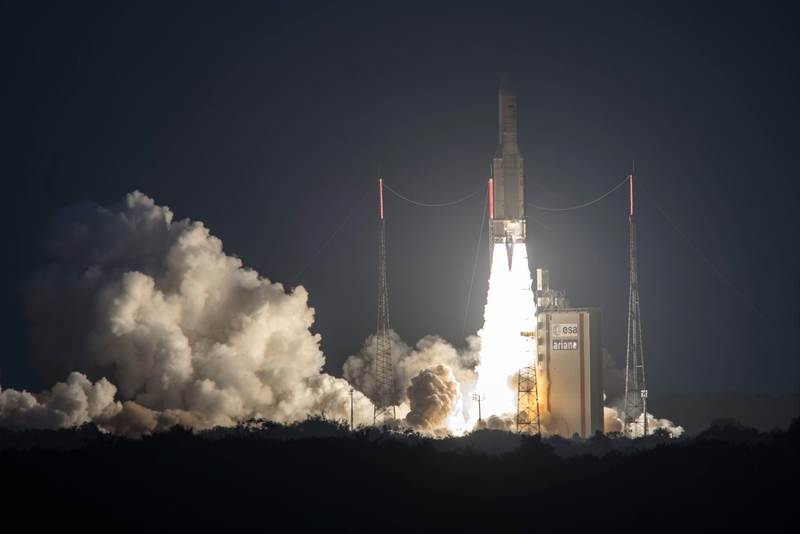 Arianespace notched another successful mission with the launch of two communication satellites. 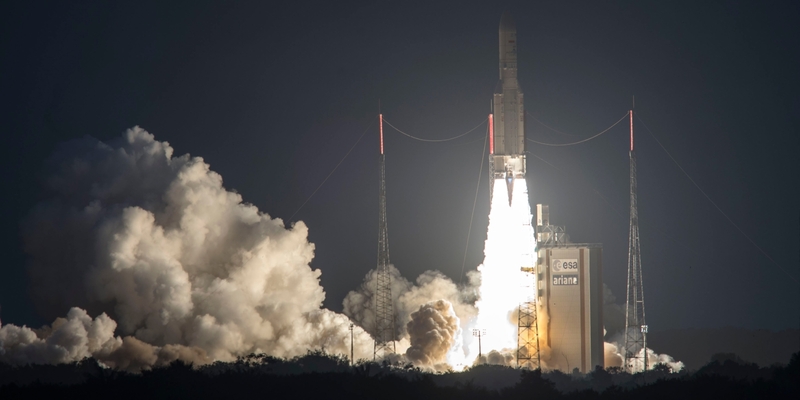 The dependable Ariane 5 heavy-lift rocket lifted off from the Guiana Space Center in French Guiana at 4:39 p.m. EST (21:39 UTC), at the beginning of the 87-minute launch window, and deployed its pair of passengers – SKY Brasil-1 and Telkom 3S – nearly 40 minutes later. This marks the first Ariane 5 launch of the year for Arianespace and follows their successful Soyuz launch just 17 days prior. The countdown for flight VA235 progressed nominally, with flight engineers working no issues as the countdown clock progressed toward main engine ignition, and at T–0, the Ariane’s flight computers commanded the core stage’s Vulcain 2 engine to roar to life. The cryogenically-fueled engine’s turbopumps began pumping liquid hydrogen and liquid oxygen to the Vulcain’s combustion chamber, and following a brief health check, the computer ignited the two P241 solid rocket boosters (SRBs). With a combined 2.92 million pounds (13,000 kilonewtons) of liftoff thrust, the 180-foot (54.8-meter) tall Ariane 5 leapt off the pad and soared into a partly cloudy sky. A few seconds after clearing the launch tower, the vehicle initiated its pitch and roll maneuvers so that it could attain the proper flight trajectory as the rocket and its payload made the “uphill” climb to geosynchronous transfer orbit (GTO). As the vehicle ascended, atmospheric pressure reached its maximum impact on the structure of the rocket. This region of high stress is often called “max Q” and is a function of the vehicle’s speed combined with the pressure exerted by the atmosphere. Nearly simultaneously, the rocket exceeded Mach 1 – the speed of sound – as it continued its steady rise to orbit. Slightly more than two minutes after ignition and nearly 44 miles (70 kilometers) in altitude, the Ariane’s twin SRBs exhausted their fuel supply and were jettisoned. The spent motors splashed down into the Atlantic Ocean and were not recovered. With the vehicle weighing a fraction of its 1.72 million pounds (780 metric tons) liftoff weight, the core stage’s Vulcain engine continued to accelerate the rocket and its payload to orbital velocity. Nearly three-and-a-half minutes into the flight, and 68 miles (110 kilometers) in altitude, the Ariane shed its protective payload fairing. Though the aerodynamic shell is required to protect the vehicle and its payload in the lower, thicker parts of the atmosphere, it becomes unnecessary mass once in the vacuum of space. The Vulcain engine continued to power the vehicle for nearly nine minutes, but with the core stage now empty of propellant, the core stage separated from the ESC-A (second) stage. The ESC-A’s highly efficient HM-7B engine, burning a cryogenic mixture of liquid hydrogen and liquid oxygen, then began its nearly 16-minute long burn to place the two satellites in their intended orbital drop-off point. More than 27 minutes after lifting off, the second stage was in a position to deliver the first of its two passengers to the 155-mile (250-kilometer) by 22,205-mile (35,736-kilometer) transfer orbit. SKY Brasil-1 was the first of the satellites to separate from the SYLDA payload carrier. A couple minutes later, and after SKY Brasil-1 was at a safe distance, SYLDA was jettisoned so that the second satellite – Telkom 3S – would be clear to deploy. After a 10 minute coast, allowing SYLDA to drift out of the area, the second satellite was released. Telkom 3S, like its SKY Brasil-1 rideshare partner, was now flying free of the launch vehicle. Both satellites will steadily raise their orbit with their onboard propulsion system and will undergo a set of checkout procedures by the ground crew before being declared operational. 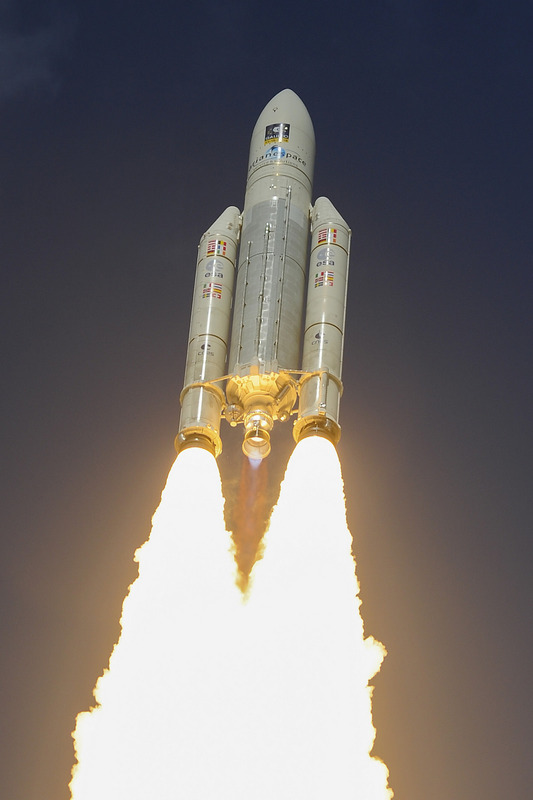 Flight VA235 marks Arianespace’s first Ariane 5 launch of 2017, and the second of a busy 2017 launch manifest for the launch provider. Their next scheduled launch is for their Vega rocket carrying the Sentinel 2B Earth observation satellite. That mission is scheduled for March 6, 2017.